Direct Install from New Jersey’s Clean Energy Program has a lot of perks; 70% off upgrades, an easy turn-key process, us as one of their contractors (just kidding…maybe.) But one big perk that not many businesses know about is: oil to natural gas conversions for existing furnaces and boilers are covered through Direct Install! So what does that mean for your business and why should you care? Easy! 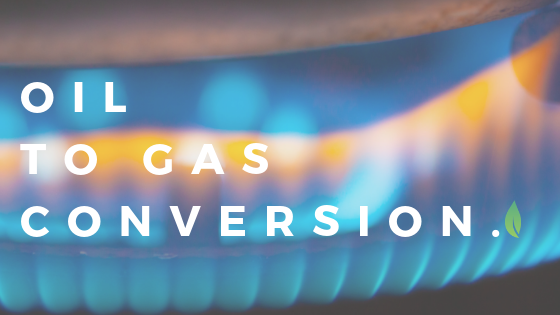 Natural gas is one of the cleanest burning fuels and it costs less than heating oil or using electricity. There’s less maintenance involved than with oil furnaces – oil furnaces must be cleaned regularly due to the residue/ash from burning. Natural gas burns cleanly. Natural gas supply is never disrupted (which is one less thing you have to worry about). No storage tank or storage monitoring needed. On the subject of storage tanks, you’ll never have to worry about an oil leak that can cause your business thousands of dollars in environmental cleanup. For customer’s looking to make the switch to natural gas and are in New Jersey Natural Gas (NJNG) territory – you’re in luck. Customers converting to NJNG may benefit from The SaveGreen Project, a 0% APR On-Bill Repayment Program (OBRP) that helps make upgrading to high-efficiency natural gas equipment through Direct Install even more easy and affordable. If you’re not in New Jersey Natural Gas territory – don’t worry! Conversions are still covered at up to 70% off through Direct Install, which is much better than paying 100% of the cost. For businesses and commercial buildings serviced by propane or are on a municipal electric cooperative customer – there’s still hope! The Department of Energy for a State Energy Program (SEP) offers funding on a first-come, first-served basis. Existing program guidelines and rules related to Direct Install will apply. The latest round of State Energy Program (SEP) funding has been completed, with the next round expecting to be available around June. New Jersey’s Clean Energy Program will post updates (and so will we!) as it gets closer to the next release here. Get started on your commercial oil to gas conversion today with a free assessment!